It has been a summer of big headlines for those that work with or are affected by eXtensible Business Reporting Language (XBRL). The most common theme is “the data continues to improve”, whether it be through stepped-up enforcement of quality, or through the proliferation of watchdog organizations and analysis tools. DATA Act – The DATA Act was signed into law by President Barack Obama on May 7. This concluded years of effort by several members of Congress to mandate a universal and transparent data standard for the Federal government. Congressional leaders included Senator Mark Warner (D-VA), Representative Darrell Issa (R-CA), Representative Elijah Cummings (D-MD), and Senator Rob Portman (R-OH). Also, advocacy groups like the Data Transparency Coalition were instrumental in informing the public and our elected officials alike throughout the multi-year process. Craig Lewis Steps Down – Craig Lewis, the SEC’s former Chief Economist and Director of the Division of Risk, Strategy, and Financial Innovation, retired from his position with the Commission to resume his full-time work as Professor of Finance at Vanderbilt University. This story is significant as Lewis was the chief architect of the SEC’s Accounting Quality Model (AQM), known familiarly as “RoboCop”. This is the system that is being built and implemented to automate the review process for XBRL filings submitted by public filers, and has drawn much speculation about what it is looking at (see “What is the AQM” next). On July 21, the SEC announced that Mark Flannery would succeed Lewis, and many eyes will now turn to him as the lead enforcer of XBRL filing quality. You can read more about Dr. Flannery here. XBRL Global Ledger 2014 – Many have speculated that XBRL GL is the “next big thing” for XBRL, taking XBRL another step deeper into comprehensive financial accounting for all businesses. It is the internal business accounting data standard, and some have even speculated about it being the “‘Y’BRL to follow XBRL … XBRL’s oldest ‘next big thing’”. XBRL GL took a step forward this summer with the Working Group’s July 16 publication of the draft 2014 taxonomy and framework (and the press release can be found here). Universal adoption of the standard would greatly assist accountants at public companies that are tasked with preparing filings for the SEC, as the information would already be recorded internally in a standard language that could readily be imported for preparation of XBRL filing with the SEC. This would greatly reduce the time and effort needed to prepare filings, and help reconcile internal and external reporting. You can read more about XBRL GL and intra-company XBRL usage here. SEC Clamps Down On XBRL Filing Holdouts – From InformationWeek, “The Securities and Exchange Commission is clamping down on public companies that fail to submit their financial disclosure statements as structured data, agency officials said. The SEC's Division of Corporation Finance sent letters on July 7 to an unspecified number of companies that are not submitting their financial disclosure statements as machine-readable, structured data.” This step by the SEC is consistent with their “Dear CFO Letter” (more next week), demonstrating two significant actions that signal that they are serious about enforcing XBRL filings quality and completeness. This will improve an already rich data source, improving transparency and giving investors unprecedented access and analysis potential with public filings. 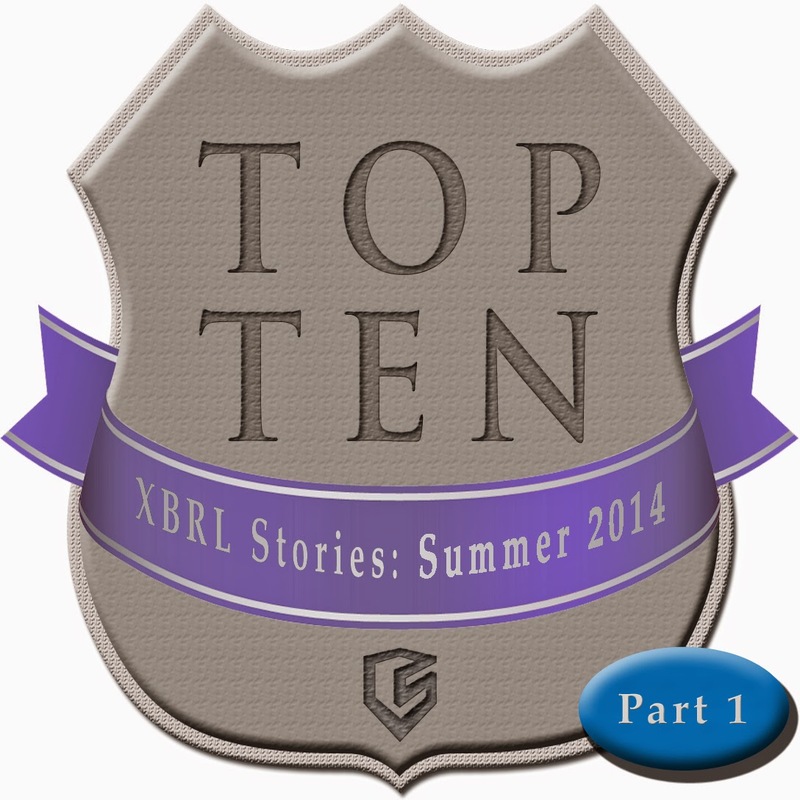 That is a quick synopsis of five of the ten lead stories for XBRL this summer. The final five stories on this list – including the number one headline – can be found here in Part 2. “The European Banking Authority (EBA) published its XBRL taxonomy … [that] defines a representation for data collection under the reporting requirements related to financial information, losses stemming from lending collateralised by immovable property, large exposures, leverage ratio and liquidity ratios.” Read more here. Corporate Actions and XBRL: “Enter XBRL. It enables seamless and automatic transmission of data in a form that can be automatically acted upon without the need for human intervention. Therefore, corporate actions can be transmitted instantaneously.” Read more here. “Sellers of asset-backed securities (ABS) must now abide by more stringent disclosure and reporting rules.” Read more here. “EIOPA publishes an update on Data Point Model and XBRL taxonomy design. … In addition, EIOPA publishes a ‘Test Instance Release Package’” Read more here.